Daily Illuminator: Leak Of The Week! July 14, 2011: Leak Of The Week! 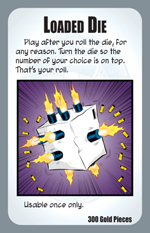 As Munchkin Axe Cop is being printed, we thought you'd like to see a few of the cards. This week it's a new twist on an old favorite: Loaded Die. 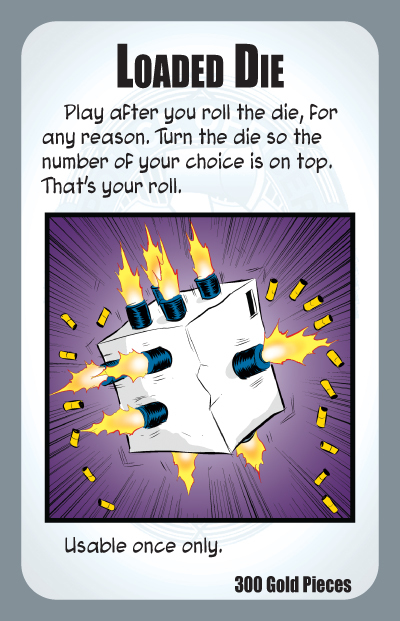 Every Munchkin set has a couple of these very useful cards -- who doesn't need to change your die roll at times? But being Munchkin Axe Cop, it needed to be just a little . . . heavier on the firepower. Guns for pips? No wonder their gun bill is so high! I Left My Heart In San Diego . . .
. . . San Diego Comic Con that is! While I won't get to see the spectacular that SDCC has grown into, we will have staffers running demos at booth 4423 -- Phil Reed, Operating Officer Extraordinaire, Andrew Hackard, the Munchkin Behind Munchkin, and Ben Williams, He Who Makes It Pretty. Stop by and say hello, get a sneak peek at cards from Munchkin Axe Cop, get a demo, and maybe . . . just maybe . . . pick up a copy of Munchkin Conan the Barbarian.